Everyone is trying to cut down on their sugar and sodium intake these days. It’s actually not that hard to do if you prepare most of your meals at home. However, when the holiday season is around, one tends to make a few exceptions. For me, one of the things I indulge in during the year-end holidays is candy. I prefer snacking on “Christmas-themed” confections that are specially wrapped for the occasion, but these can sometimes be quite expensive. Don’t worry, though, because you can always make your own candy and give them out to friends and family as gifts. Try this recipe for honeycomb candy (also known as the hokey pokey, sponge toffee and cinder toffee in some countries). It’s quite a thrill to make, thanks to the chemical reaction that happens when adding sodium bicarbonate to liquid sugar. Melt the sugar and honey (you can add a tablespoon of water if you want, but it isn’t necessary) in a medium to large pot. Don’t use a small pot or pan because the “candy” will more or less quadruple in size later on. Once the sugar has dissolved, put the heat on low and stop stirring it. Keep on boiling the mixture until it turns golden amber or it reaches 150℃ on your sugar thermometer. I prefer to do the “drop test” – dip a spoon into the mixture and place a drop of sugar liquid into cold water. That drop of liquid needs to be hard a few seconds after it touches the cold water. If it’s still soft, keep boiling on low heat. When your sugar syrup is at the correct stage, take it off the heat and quickly add the baking soda and stir or whisk. The mixture will puff up immediately so be sure to have your prepared tray or tin close by (you can line the tray with lightly greased baking sheet or use a silicone mat, which is much easier). 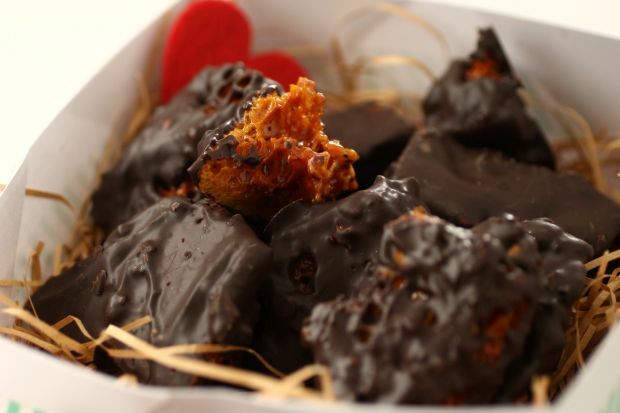 While the honeycomb cools down, melt your dark chocolate in a heatproof bowl that’s placed over a bain marie. Break the honeycomb into smaller pieces and dip each one into the melted chocolate. It is better to coat the candy in chocolate because this will help keep the crunchy texture of the honeycomb.